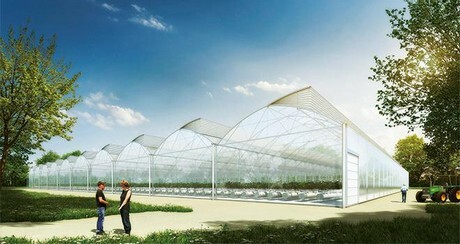 During this year's Sival, a new greenhouse concept was launched by CMF Groupe. The GreenPush BioActive is a semi-closed multispan concept. "We want to limit the pest pressure and offer a more homogeneous climate", Corenthin (Felix) Chassouant with CMF Groupe explains. As shown at the Sival and in the video above, the GreenPush BioActive is equipped with insect nets, in the roof and windows. A constant airflow into the greenhouses creates over-pressure, making it impossible for insects to enter the greenhouse and thus creating favorable conditions for IPM. The air entering into the greenhouse is controlled by a high-tech climate management system, offering extra control over the greenhouse air. "Temperature, humidity and CO2 can be optimized in an easy way, offering growers extra tools to control their climate", Felix continues. 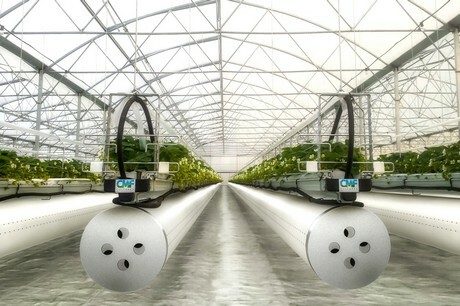 "Since the air is dehumidified before it enters the greenhouse anyhow, it offers opportunities to recycle the air various times and create a homogeneous, favorable climate for the crop while ensuring optimal heating conditions and using the energy to the best. In warmer periods and with the use of cooling pads, it's also possible to cool the outside air being brought into the greenhouse." The GreenPush BioActiv is equipped with the oval tubes - like the GreenPush concept that was launched last year. The ovalized tube makes higher widths possible and thus more volume in the greenhouse. "This concept is for both glass as well as foil greenhouses", Felix tells us. "The larger widths & higher volume gives a better humidity and temperature control within the greenhouse, whereas the amount of shadow is significantly lower thanks to the larger distance between posts. With the GreenPush BioActiv we take the next step." Like CMF's other options, the CMF’s GreenPush BioActiv turnkey solution can be adapted to all climatic conditions to obtain more homogeneous crops by reducing or even eliminating chemical products.